As the essay of the book explains, this unique artist’s book was originally intended to be only an essay, at the invitation of Smith College Library for the library newsletter. It evolved into a memorial gift in the guise of conceptual art geared to Smith alumna Julia Child. 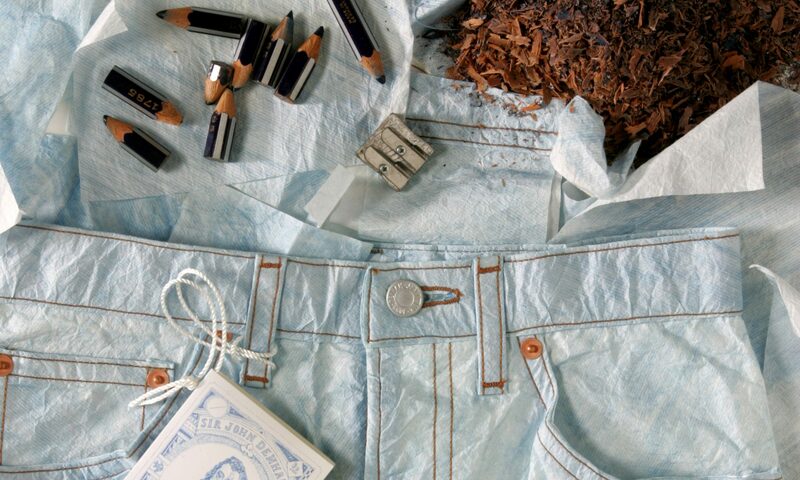 The work is housed in the pocket of a Hotel Cipriani Cooking School apron, signed by Julia and given by her to the artist. The apron pictured on the site here is not the signed apron. It is an identical twin, also given to the artist by Julia, used as a work apron in the artist’s studio. Blue ink-jet text on potato starch pages in honor of the Cordon Bleu cooking school where Julia Child studied in Paris. The cover and pages are laminated, rendering them spill-proof. The tomato seeds on the covers were wiped onto white paper by Julia’s friend Faith Willinger in Florence, Italy, on the day she signed the Cipriani Cooking School apron in which the book is housed, with the intent of encouraging others to grow heirloom tomatoes. As cookbooks, to be functional, need to open flat, this tribute is spiral bound in a blue plastic binding. It is a unique edition, existing in only one copy, inspired by a unique individual and her devotion to her Alma Mater, Smith College. Another copy, without the apron signed by Julia and others, will be deposited in Cambridge, Massachusetts, her East Coast roost, at the Schlesinger Library, where Julia helped institute an important culinary collection. Probably the best thing about being an artist is having the opportunity to meet so many interesting people through work. As my work mostly consists of artist’s books, I have had the pleasure of meeting many librarians and curators at museums, public libraries and university collections like Smith’s rare book division in Neilson Library. One never knows what might come out of a meeting. Sometimes a purchase, sometimes a proposal for a show or a lecture, or perhaps just an interesting exchange of knowledge, a mutual show-and-tell. At a meeting at the Boston Museum of Fine Arts over a decade ago, former head of the library Nancy Allen, who currently works for the Mellon Foundation on artSTOR, invited me to present my work to the Library Visiting Committee. She hoped that by acquainting people with the genre of artist’s books, she might be able to increase acquisition funds earmarked for them. Among the members invited to the dinner afterward was Pat Ross Pratt, Smith class of ‘51. Pat introduced herself to me at the dinner, and we immediately discovered friends in common through summers in Maine. She suggested we meet up in Venice, Italy a few months later, close to my home in Bologna, where she would be traveling with her husband Herbert and good friend Julia Child, Smith ‘34. Fortunately for all of us, the invitation to Venice at the behest of the Cipriani Hotel cooking school lasted for six straight years. Within five minutes of meeting Julia, then 81 years old, I was struck by one of her most outstanding characteristics – her interest in others. When it somehow came out right off the bat that I document recycling around the world, she immediately came up with two examples for me, unsolicited. From her experiences in France she recounted how bottles are put on fruit tree branches so that pears may grow inside the bottles for liqueur, and from Boston she cited the baking of bread in a coffee tin. Julia loved art, but she preferred people. On a five day trip to Friuli two years later, Pat, who is also an artist, and I tried to pack in as many museums as possible. Julia insisted on mixing with the locals, enjoying her incognito status in Europe, occasionally to my consternation. “I need a rainhat,” she declared, and made us stop the car on the way to the archeological museum so she could she poke around. She didn’t seek exclusive locales. In Cambridge Julia would make similar requests, asking us to pull over for a coffee and cookie at Starbucks. She wasn’t about to let any fetters of fame interfere with her earthly desires. Julia was friends with a lot of people, largely because she knew how to be a good friend. She knew who her friends were, having acquired many long before she became public figure in her 60’s. But she made new friends even during her brief final tenure in California.The fact that she always answered her mail and sent thank you notes was indicative of her respect for others, as well as her industrious nature. As opposed to sending holiday greetings, she responded to them. For many years, she and her artist husband Paul would send back Valentine’s greetings in response to Christmas Cards. I was particularly touched by her last note, several months before she died. I had sent her a photograph of my latest work, a pair of faux blue-jeans made of Japanese paper. “The paper jeans are marvelous. But what does one DO with them?” she commented. Perhaps it was her curiosity that made her a natural friend. When Pat told her I had a show up at the Farnsworth Art Museum in Rockland, Maine, Julia made her way over from the North Haven ferry during a family vacation. She showed up at the front entrance unannounced, declaring she was there to see Angela Lorenz’s work. The staff was electrified and the head curator recounted proudly to me several days later that she took Julia around my exhibition personally. Two months later, Julia and the Pratts stayed in our home in Bologna, on their way from Venice to Florence. Although I had eaten many meals with Julia in the preceding years, I cringed to cook for her. Two summers earlier, the grandson of her dear college friend Betty Kubler, Smith ’33, told me how Julia and his grandparents often stopped off at his place for lunch in South Thomaston heading south from Mount Desert Island on their way to the Pratt’s at Prouts Neck. I was incredulous he wasn’t nervous about what to cook. “Oh no,” he assured me, “She’ll eat Kentucky Fried Chicken.” Indeed, she didn’t have a problem eating lunch at the Italian roadside chain Autogrill in the Veneto, I’d noticed. Her courageous eating habits made a huge impression on me. To earn my keep on the Friuli trip, I had to translate all the menus, and navigate us to the exquisite out-of-the-way restaurants her friend and colleague Faith Willinger recommended. Although I was pregnant at the time, that didn’t preclude creeping around to the back of a house in dark woods at night to bang on a window for directions. At a loss for certain culinary terms in english, I referred to young wild venison as “Bambi” and dried, shredded horsemeat as “filet of filly”. A frontierswoman at heart from Southern California, Julia alone ordered the filly, served with lemon squeezed on top. While I wanted to impress Julia and the Pratts with Bologna’s finest, I wasn’t about to make lasagna, invented in Bologna, or attempt the famous Bolognese meat sauce, served on tagliatelle, not with spaghetti, contrary to restaurant menus from Bolivia to Japan. So my husband Gianni and I boiled up three handmade fresh pastas we bought for them to sample: tortellini(traditionally served in broth), tortelloni(traditionally served with butter and sage), and passatelli, an extruded pasta made with egg, flour and bone marrow, served in broth. After a salad, we finished with a Bolognese sweet-crust pie with a noodle filling. No wonder Julia didn’t consider the preparation of Italian food really as cooking. It’s more about fresh ingredients than preparation, she’d noticed, luckily for entertaining purposes. But in later years, Julia was one for preparing simple meals herself, I discovered, when she secretly put me up for the night in Cambridge so that I could surprise my family on Thanksgiving the next day. Food purveyors the world over were sending her free products in the mail, including frozen steaks, which we sampled that night. Ever a proponent of eggs and butter as opposed to “fat-free” processed foods, which she just considered a dangerous fad, Julia served up eggs in the morning. And bacon, I think. I’m not one to take menu notes for posterity, no matter who’s cooking. In the live satellite interview from the Pratt’s living room on Julia’s 90th birthday, the Good Morning America anchor Charlie Gibson got it right, on the other side of the split screen, when he said it was only a tunafish sandwich he fixed her, but it was the best he’d ever had. Julia hobnobbed with a lot of people, including a series of U.S. presidents, but she never talked about her experiences unless someone asked, and even then might change the subject. The only time I asked her a question relating to her public life was on the night I met her, over dinner at the Cipriani Hotel. We were an enthusiastic hodge-podge bunch, even though the table included the director of the Hotel chain, Natale Rusconi, husband of Connie Titzel Rusconi, Smith ‘62. Everyone was offering tastes from various dishes and passing things around while the elegant, subdued patrons surrounding us looked on in silence. My curiosity got the best of me. I wanted to know about David Letterman. She tactfully called him a “naughty boy” and said she refused the last invitation to his show which would have required her to chop a bunch of watermelons with an axe. She may have been a ham, but only if it served her purpose, that of bringing knowledge of cooking to a vast public. Chopping watermelons would have been like Dan Ackroyd’s version of Julia on Saturday Night Live, not Julia Child, live. Part of the desire to imitate Julia sprang from her very distinct voice. I was told by Trevor Nelson, the youngest producer ever at “60 Minutes”, who tragically died at age 34 the summer before Julia did, that her voice was so recognizable radio programs loved to have her as a guest. In an odd revelation on fame he also informed me, when he was still working at Christian Science Monitor Radio, her obituary had already been prepared, long before her death. This occurred to me as I was driving to Belfast, Maine on an errand, when the news of Julia’s death came over the radio, two days shy of her 92nd birthday. I knew Pat was probably at her side, having gone out to Santa Barbara to celebrate. A memorial text spontaneously formed in my head. But what can I possibly add to the mountains of mass-media on Julia, I questioned. Pat disagreed, saying I knew her in a special way. She was right – I knew her through Pat and Herbert Pratt. It was not until my visit to Smith last fall that I seriously considered writing something. Karen Kukil asked to interview me briefly about my friendship with Julia as she was installing a work of mine in a case in memory of Julia. The book in question, “Paper Plates – She’s a Dish”, was purchased in Julia’s honor by fellow friends and alumnae a number of years ago. I donated the printing plate, or matrix, used to make one of the six prints in the series. It was created by cooking spaghetti and gluing it down onto a drawing of a woman from an Italian Renaissance majolica plate. I have learned a lot about food and friends since meeting Julia. I’m one of legions. The librarian at the Clark Art Institute, Susan Roeper, told me how her 11-year-old twins rushed up to her when she came home from work to tell her that Julia had died. I know Julia would have been very pleased at the passion for cooking she inspired in the two young sisters, who ask their mother if they should chop the onions “the Julia way”. I have only hazy childhood memories of the spirited woman who came on after “Zoom” on Channel 2 in Boston. I was more apt to turn to The Three Stooges, who had their own comic variety of food preparation. But I know what the linoleum floor looked like in her kitchen. On a backstage tour of the Smithsonian History Museum where the technicians re-installed her Cambridge kitchen, they gave us scraps to take home of the faux linoleum reproduced from the original. I’m giving a piece of this to Smith’s library, for although Julia gave her papers to Radcliffe’s Schlesinger Library, where she had been instrumental in establishing a major culinary collection, she gave her home to Smith. It’s only fitting Smith gets a piece of the linoleum, too. Our acquaintance commenced at the Cipriani and ended at the Four Seasons Hotel. My husband and I flew from Maine to DC to participate in the 90th birthday celebration at the Smithsonian, part of the conference by the American Institute of Wine and Food, of which Julia was a founder. A few friends gathered in her room for champagne and caviar before going over to the gala in the museum. Of course she had her work cut out for her, even there, with huge stacks of the anniversary edition of “Mastering the Art of French Cooking” to sign on the table. She may have been privy to many a banquet, but there was no end to her industry. We traded books. You must come out and visit me in my new digs, she said. Regretfully, I didn’t. That was our only glimpse of her that night. She wisely fled the fete after a brief appearance, opting instead for a quiet dinner with her assistant, Stephanie Hersch. Like a bride at her own wedding, she probably wouldn’t have tasted a morsel of the artistic spread laid out by scores of the best restaurants in D.C., each trying to outdo the next in flavor, originality and presentation. It was her final East Coast appearance, as she, regrettably, was not able to return the following year to accept her Medal of Freedom at the White House. Julia’s kitchen has proved to be one of the most popular exhibitions ever at the National Museum of American History. When curator Karen Kukil suggested the library newsletter would be interested in my reflections on Julia, the book artist in me started imagining special packaging for the essay. I remembered the apron from the Cipriani Scuola di Cucina that Julia, Pat and Herbert autographed and gave to us as a gift when they stayed here. It has an unusually large pocket. Actually, they gave us two. I couldn’t bear to use the autographed copy, but the other was good when I needed to glue books together. Then it occurred to me to add a few signatures of Julia’s friends, like Faith Willinger in Florence, who wrote to her in the 70’s asking advice on becoming to Italian cooking what Julia was to French cuisine. It must have been good advice. It also seeded a friendship. This time I visited Faith, she cooked me up some pasta with fresh tomato sauce, after taking out the seeds and spreading them to dry on sheets of paper. These sheets of tomato seeds, laminated, form the covers of this essay/artist’s book, reminiscent of a restaurant menu, or a spill-proof cookbook. And so the recipe for friendship continues. When I remarked to Faith how art is a great profession for meeting people, she replied that cooking inevitably leads to friendship too, for food, as well as art, is meant to be shared. Seeds may seem absent of life at the end of a meal, but their legacy, when nourished, will continue.